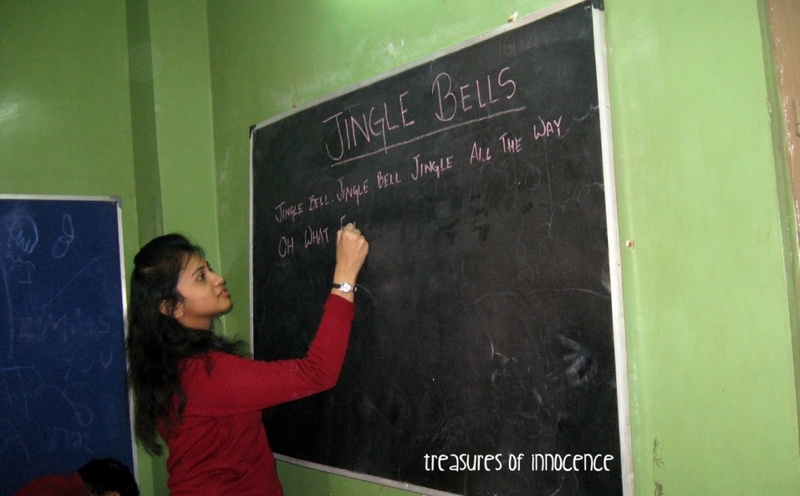 During my days at Jadavpur University when I was studying in BSc 2nd year, I got a fine opportunity to teach the less privileged children through an NGO, “Treasures of Innocence”, founded by Ms. Rani Bhowani. I worked there as a volunteer and here I would like to share about one of such experiences while undertaking a project of HELGO School. From Calcutta, we had to travel to a place called Tikiapara in Howrah. The place where the school was situated was a pro Muslim slum with the area divided into small colonies, consisting of dark stingy houses. Climbing up the staircase, we made our way to the school and to our surprise, were welcomed by a bunch of children! At first, they hid in corners to look at us but as we greeted and interacted with them, they sat quietly in rows. They belonged to different age groups, ranging from five to ten year. We started our Christmas program by telling them the story of baby Jesus and how he reached out his hands in the service of the poor. They were delighted to learn the stories and listened with great enthusiasm. Next we taught them various carols like “Hark, the Herald angels sing” and “We three Kings of orient are”, where we sang one line and the children were asked to repeat after us. We got with us a handmade Santa Claus and having handed it over to each one of them, we asked them to make a wish. Some wished for a bicycle while others wished for a story book, but of all of them which touched me the most was that of a boy, who came up to me slowly and cried loudly,” I want my parents”. It seemed that I was struck in between a horrible nightmare where I was converted into a stone, unable to think or react anyway. After this we organised a craft session where I helped the children in making the Christmas tree and the snowman. We provided them with colours and cotton and together we made paper cuttings. In the afternoon we went for our lunch together, after which we set off for Calcutta. On returning home, I sat alone in my room for a long time alone, pondering and recollecting every moment I had spend with my children. The way we sang together, laughed together and shared our stories…all remained afresh in my mind. At times, we crib for so many things in life, not realising how easily we can get satisfaction in small things. Just that you need to “count your blessing” and “name them one by one” and “it will surprise you what the Lord hath done”.